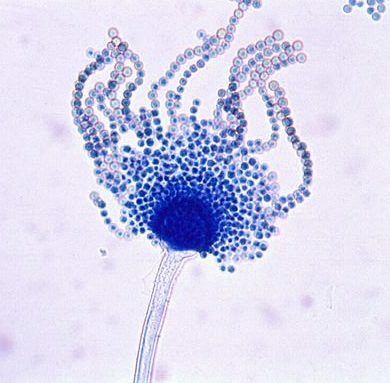 Aspergillus spores are very very small (2-3 microns is a reasonable size estimate). The function of these spores is to be released into the air and to resettle some distance from the original fungal growth and then grow, the purpose being to spread the fungus far and wide. After millions of years of evolution, fungal spores have become extremely good at this – the spores are very small and can float in air at the slightest encouragement from air currents. Consequently the air we all breathe every day contains many fungal spores. Most people have a highly efficient immune system that removes fungal spores from the lungs, so those breathed in are quickly destroyed. However some people may develop an allergic reaction and others are vulnerable to infection (e.g. those with an impaired immune system, such as after a transplant or during treatment for some types of cancer). There have been a few rare cases of (apparently) completely healthy people accidentally breathing in huge numbers of spores – the latest was a healthy 40 year old man who opened bags of composted plant material, which must have blown clouds of mould into his face (News story). He became very ill within a day or two and died. 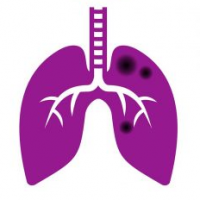 There is therefore reasonable evidence that awareness of the risks of breathing in fungal spores is important, and the message needs to be spread far and wide. Clearly the best way to avoid health problems is to remove the source of the problem – in this case avoid situations where you are exposed to high numbers of spores. Unfortunately that is not always possible – the source might be part of your daily life or your work (e.g. if you are a gardener or agricultural worker). 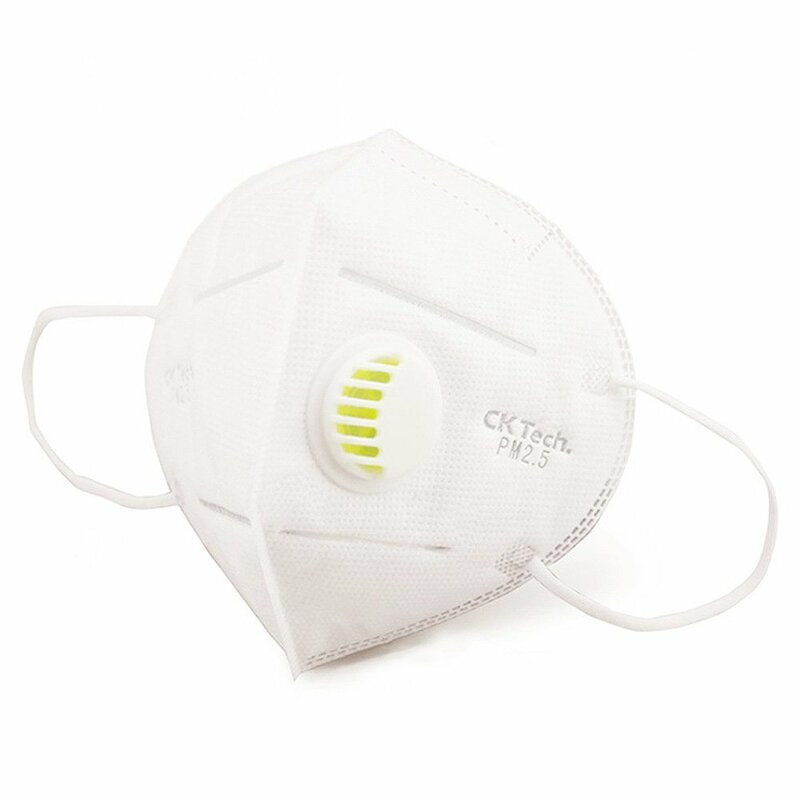 Face masks represent the most cost effective solution if an individual must breathe in air that contains a lot of spores. They are light and relatively cheap while not being too obtrusive to the user. Which Face Mask to use? There are a huge range of masks and filtration material available on the market – traditionally aimed at the industrial and medical protection markets, but now increasingly available to the domestic user. The vast majority of masks readily available are useless at filtering out the tiny fungal spores e.g. a cheap paper mask sold at your local DIY store to prevent dust inhalation is far too coarse to filter out mould spores. We need to concentrate on filters that remove particles 2 microns in diameter – these are a little harder to come by. Any filter that you intend for use to prevent exposure to fungal spores must be graded as a HEPA filter. There are three grades of HEPA filters: N95, N99 and N100, the numbers referring to the percent of particles 0.3 microns in size that filter is capable of removing from air that passes through it. An N95 filter will therefore remove 95% of all particles 0.3 microns in size from air that passes through it. Fungal spores are 2-3 microns in size so an N95 filter will remove far more than 95% of fungal spores from the air, though some will still get through. This standard is generally thought to be the best combination of efficiency and cost for the average home user – such as a gardener. Industrial users (e.g. workers remediating mouldy homes or other premises) may be exposed to far more spores and may opt for the more efficient N99 or N100 filters, at higher cost. In the UK and Europe, the standards referred to are FFP1 (not appropriate for this purpose), FFP2 and FFP3. FFP2 is equivalent to N95 and FFP3 offers higher protection. Masks generally cost £2-3 each and are intended for single use. More expensive masks are available which can be used more than once – see 3M for one possible supplier, also Amazon are used by many other suppliers. These masks must be correctly fitted to work to their full potential, so be sure to follow instructions carefully. Guidelines for employers are given here and there is also an illustrated guide. Industrial users are often advised to wear a full face mask, including eye protection (to prevent eye irritation) and to use an additional filter to remove the chemical gases given off by moulds (VOC’s), but this is mainly for people being heavily exposed to clouds of spores day after day. NOTE: Many users find that facemasks become damp and less effective & less comfortable after an hour or so in use. More recent models of facemask have an exhale valve built into them that allows exhaled air to bypass the mask material and thus reduce dampness. Most people report that these facemasks are more comfortable for longer and are better value for money.